Watching the nature documentaries that showcase the best of the planet is always interesting. There is just so much learn about nature and its other life forms. But while it seems beautiful, it can also be cruel. 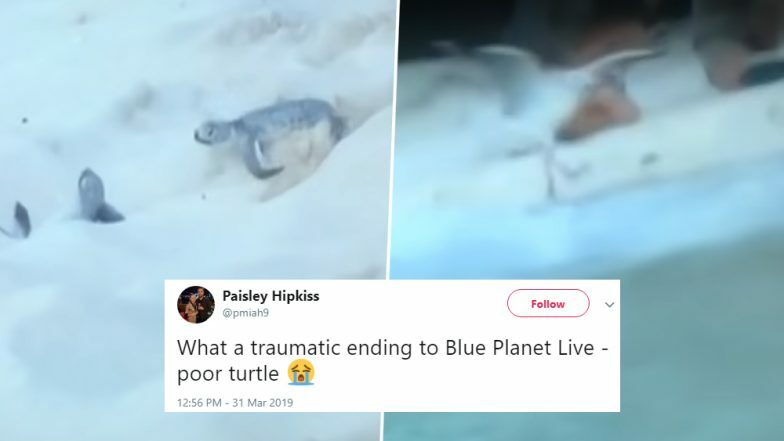 BBC's Blue Planet Live episode went horribly wrong when the release of a turtle into the waters saw it instantly turn into a seagull's breakfast! The episode was filming the release of the baby turtles into the sea on Heron Island in Australia. Just as the turtles were released, a seagull swooped down and carried away one of them. The host was talking about turtle conservation and how it is difficult for them to survive when the seagull attacked on its prey. The moment of irony and shock filled the users and some of them couldn't take it. Some viewers took to Twitter to express the shock after seeing the video. Man Gets Bitten by a Turtle on Lips After He Tried to Smooch Him During a Fishing Trip in Massachusetts (Watch Video). It is a quite common sight and not all baby turtles that are released actually make their way to the sea completely. They get feasted on by the predators and even as they enter the water, they have the bigger fish eating on them. So very few of the turtles actually survive their way in the big ocean bodies. Since the incident was captured live on the show, the viewers were shocked. Drunk Seagulls Rescued After Being Found 'Confused And Disoriented' Near Beaches in Southern England. The host tried to help the turtles reach the edge of the water but the seagull got there first and took away one of the turtles. Some of the users were in shock, while others found humour in the way of life in nature. Check how Twitter reacted to the video. Big build up on blue planet live there... releasing 6 baby turtles into the ocean. Why didn't the host rescue? Some people were really shocked while others questioned how could the host not even notice. Well, that's really how nature works. There is a food chain and not each baby makes its way through the life process. But at least, it passes on a message that not all turtles make their way through and thus conservation efforts are constantly necessary.